Lois Elizabeth Waters, 94, passed away on Friday, September 7th, 2018 in Chesapeake, Virginia. Lois was born on September 20th, 1923 in South Carolina, she was the daughter of Charlie and Janie Jones and wife of Willie Waters. Lois worked as a Health Aid for Hempstead Community Education Center and was a member of Pleasant Grove Baptist Church. 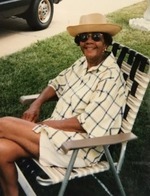 She is survived by Willie Waters, husband, Chesapeake, VA; William Waters, son, Whitestone, N.Y; Beverly (Muffin) Tanksley, daughter, Fresh Medows, NY; Harold Middlebrook, stepson, Knoxville,TN; Estella Powell- stepdaughter, NY; David Travis Tanksley, Jr., grandson; Evan Pierce Tanksley, grandson; Troy Waters Everett, Granddaughter, Ellenwood, GA; Sean Waters, grandson, Summerville, SC; Billie Waters, granddaughter, Baltimore, MD and a host of family members and friends. She was preceded in death by two sisters, Edith White and Nellie Canzater, and four brothers, Lawrence Jones, Melvin Jones, Charlie Jones, and Frank Jones. The Funeral Service was held on Tuesday, September 11th, 2018 at 12:00 pm at Carver Memorial Cemetery 2320 E Washington St Suffolk, Virginia 23434. To send flowers to the family of Lois Elizabeth Waters (Jones), please visit our Heartfelt Sympathies Store.